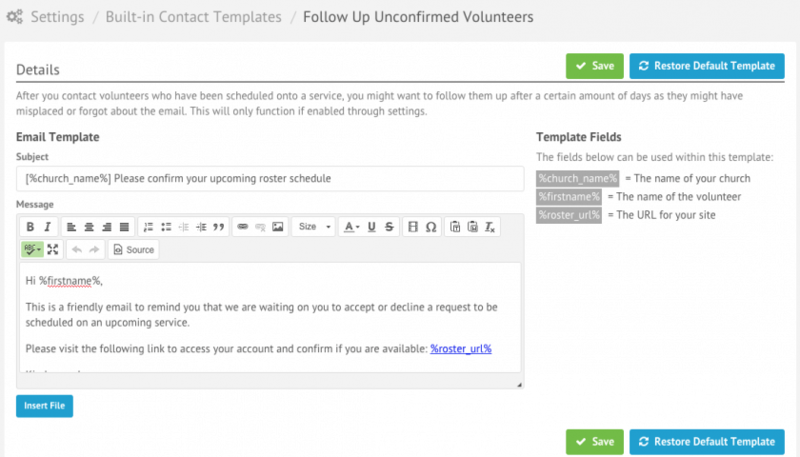 To enable reminders to be sent automatically to volunteers, go to Settings and then select Services. Scroll to the heading marked as ‘Volunteer Schedule Reminder’. Here you can choose to send either an Email, SMS or both, as well as how many days before a service they should be sent. To edit the email template, simply click on the link or by going to Emails & Letters > Built-in Contact Templates > Volunteer Schedule Reminder. You can use your own customized email and SMS template by editing the templates in this page.